SYNOPSIS: After a cataclysmic plague sweeps across America, survivors come together to form city state-like communities for safety. Daisy Walker is a Runner for The Compound, a mix of post-apocalyptic postal service and black market salvaging operation. It is a Runner's job to ferry items and people between settlements, and on occasion scavenge through the ruins of the old world. Daisy is the best there is at what she does. Out beyond the settlement walls are innumerable dangers: feral animals, crumbling structures, and Abominations - those that were touched by the plague and became something other. After a decade of surviving, Daisy isn't phased by any of it - until her lover, another Runner named Heather goes missing on a job. Desperate to find her, Daisy begins to see that there may be little difference between the world inside the walls and the horrors beyond. The series summary lays out perfectly the premise behind this beautifully designed new comic that is less about the horrors of a dystopian future brought on by a man-made plague and more about the shackles we bind ourselves with out of complacency and familiarity. Ten years into an America changed by a contagion, survivors have isolated themselves in communities like The Compound to separate themselves from the masses afflicted with the virus that they call Abominations. Besides being in a zombie-like state the Abominations have foliage growing from their bodies although we're not told why just yet. It could symbolize the earth reclaiming its soil after eons of abuse. The Compound contracts Runners like Daisy to be their couriers for things outside the walls risking their lives and conforming to a type of indentured servitude to the Compound and its rules. Ayala briefly describes the world befallen by a national plague in the opening pages and quickly drops the reader into that new reality. There isn't a lot of backstory and there doesn't have to be when the man Daisy saves on the way back to the Compound serves as an avatar for the reader. As he asks questions Daisy provides answers that fill in some of the blanks to this new world. Arriving at the Compound she's admonished for being late and receiving a gift from one of their trading partners. The folks in charge of the Compound seem to adhere to some very strict rules. Runners even have a code of ethics and a pledge. Whatever this place is whether an altruistic safe haven or a corporately run institution, many questions remain but one thing for sure is that Daisy and her girlfriend, Heather see their future differently. Daisy seems quite content in her routine of venturing outside of the Compound scavaging, bartering, delivering, etc despite the danger. Heather wants out of the Compound to travel elsewhere and can't understand why Daisy wants to remain under the thumb of her bosses even though she's already fulfilled her contract. Does Daisy remain with an entity providing security and relative comfort or does she use her agency to explore a better opportunity for more freedom? This is where it suddenly dawned on me that Ayala could (stress "could") be using 'The Wilds' as an allegory for the comic book industry. The Compound might represent the Big Two who provide creatives an opportunity for stability and fame but must adhere to certain parameters given the canonical history of its properties. Freedom outside of those "walls" could mean freelancing on their own making original creator-owned projects that provide some ownership and pride. I can only assume the zombies are a metaphor for comment section trolls obviously. This is just my interpretation of the themes in the comic. Emily Pearson and Marissa Louise provide a very clean, colorful, and sharp artistic look to the issue. It sort of belies the air of danger and tension that a post-apocalyptic world usually entails. Pearson's linework is meticulous and deliberate resulting in very clear and dynamic panels. Louise's colors are rich and designed from different palettes for each scene. With a number of diverse characters especially in a lead like Daisy, Louise explores a spectrum of skin tones just like in real life. 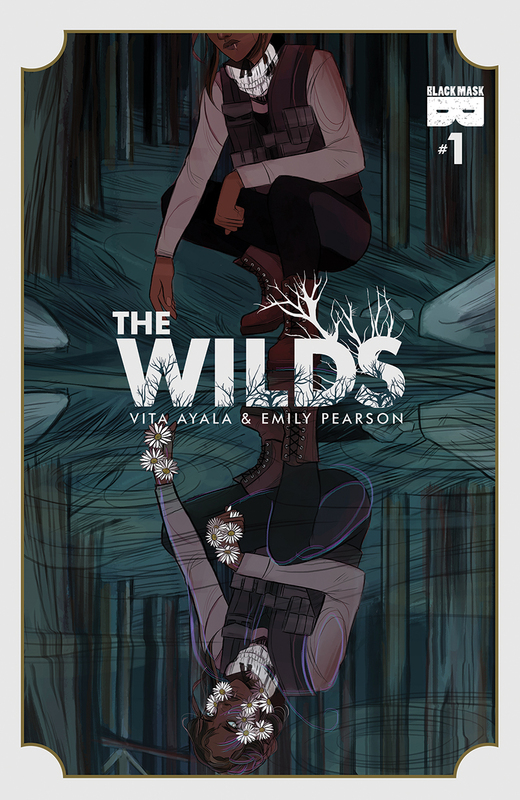 'The Wilds' is a post-apocalyptic comic unlike any other. It's driven by fully realized characters whose motivations are explored amid a world filled with danger. Ayala doesn't reveal everything making the story fresh and mysterious to keep us wanting to know more. It's an impressive debut from Black Mask Studios with another genre-defying title.